While at CES, I got a chance to talk to the nice people of Tannoy. If you haven’t heard of Tannoy, they do a lot of work with speakers. I am told that several of the speakers on the Las Vegas strip were manufactured by them, so they are experts at making things loud. They also showed me their PSP Speaker System, and it was equally impressive. It works by simply plugging the PSP into the device itself, and then you plug the other end into the video out. By the way, this will recharge your PSP as you use it. Yes, this device isn’t really designed for the gaming aspect of a PSP, but rather to play UMD video files. And believe you me, it plays them very well. It puts out a power output of 50 watts, and I was encouraged to turn it up loud, as will you. The surround sound is pretty impressive from such a small device. Another added bonus is that the user can attach an MP3 player and get quality sound. It does not work with video files, though. It does come with a very nifty infrared remote that will definitely come in handy. 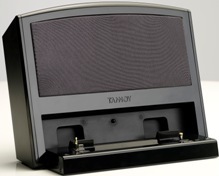 The Tannoy PSP Speaker System should be out by February, and will retail for about $199.99.